There has been a 61% rise in searches for diets in January, with the new trend of ‘Clean Living’ proving a new opportunity for brands, according to new research. The New Year arrives on a wave of reflection and while the resolutions of many will fade into obscurity, the trend of Clean Living is here to stay. 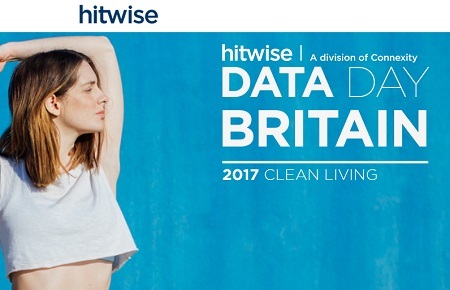 Hitwise Data-Day Britain report reveals the key consumer behaviours shaping and driving momentum behind the all-encompassing trend. Over the past year there has been a 61 per cent increase in searches for diets more generally, with key trends emerging. Veganism for example has seen a steady rise over the past three years with searches increasing by 221 per cent. Gluten-free searches have also increased by 69 per cent during this time. However, we have also seen many fad diets come and go - Paleo, for example, is losing popularity with searches decreasing by 22 per cent year on year. Clean Living behaviour resembles a movement towards a more sustainable, informed lifestyle choice, rather than a quick-fix. The data from Hitwise evidences this with 20 per cent increase in the number of searches for products focused on “nutrition” over the past two years. Madeleine Shaw, nutritional health coach and bestselling cookery writer comments on the findings: “The research from Hitwise is really exciting and shows that healthy living has become a movement. People want to live in a healthier balanced way that nourishes their mind, body and soul. There have been so many huge food and exercise trends that have taken the UK by storm and I can’t wait to see what the future has to hold." The steady rise in interest towards living a more balanced lifestyle is reflected in searches for specific food products. The brands innovating and meeting the needs of consumers here are evident. Tesco’s healthy food related searches recorded a 213% increase between 2015-2016 largely due to their “free from” range, while Sainsbury’s (60%) and Waitrose (61%) also benefitting respectively. Health technology and wearables have facilitated this conscientious behaviour – with searches for fitness trackers increasing by 72 per cent year on year. Having the gear to get you feeling healthier has extended beyond the technology into the fashion. Searches for activewear over the past year have increased by 74% with fashion labels like H&M and ASOS evolving their product offering to support this demand. Sweaty Betty is a brand at the forefront of the trend, with clicks from its social media channels to the company’s website being 28 per cent greater than the sports and fitness industry average over the past year. The knock-on effect of the Clean Living trend is a transformational period for the fitness industry. Searches for gyms and exercise have increased by 30 per cent over the past three years with traditionally more challenging sports gaining mainstream popularity – tough mudder (+68%), Crossfit (65%), Ironman (+40%). Other sports have also come into their own. “Yoga” for example has risen in popularity by 24 per cent over the past two years – with a 97 per cent increase in searches from men. Yoga now attracts an almost even split between men (49%) and women (51%) with an increasingly diverse age group – increasing amongst 18-24 year olds (21%), and over 55s (22%). Consumers are less interested in crash diets and detoxes. They crave real, lasting solutions for bettering their lives. Brands should focus on identifying short-lived fads vs consistent trends, and align themselves with stable trends for long term success. Modern consumers care more deeply than ever about ‘real’ food, effective workouts and making authentic choices that are better for them and the planet. Support their discovery and growth by providing helpful and trustworthy information. Meet consumers where they are. Social media and influencer engagement can help you connect with passionate health-driven communities. Consider partnering with brands who are already reaching this audience, in a way that will be beneficial to everyone. Hitwise sources data from a range of panel providers which allows the monitoring of three million people across the internet, within the UK on a daily basis. The internet behaviours are sampled and weighted using algorithms to be representative of the entire UK population.